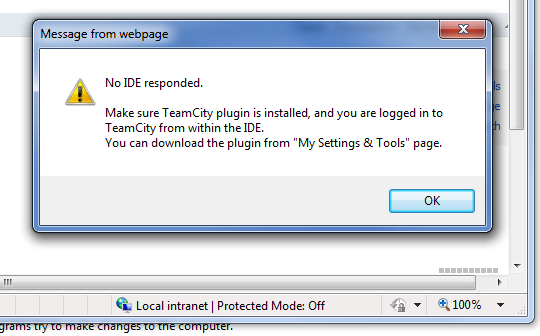 I am using TeamCity 5.1.3 and VS2010, when I click on a file to be opened in the IDE from the browser I get an error message telling me to ensure that I have the VS Addin installed and check that I am logged in, which I am. BTW, this used to work a while ago, but it could have been a few months ago the last time I tried. I tried using different browsers (IE8 and Chrome 8) to no avail. Does anyone have any suggestions on what I can do to figure out why this is not working for me? Alex, could you please post your TeamCity add-in logs here. Alex, there is no any information about file activation requests in attached log. - VS add-in failed to start listening TCP port for file activation requests. You could make sure, that there is free port among 63330 - 63339. - There is some problem to transfer request from Web UI to IDE. Make shure, that firewall or antivirus software did not block requests. Also you could try to navigate on another machine. In all cases, please let me know, how did progress bar at the bottom of Web page looks like after you click 'Open in IDE'. Alex, please check, that Visual Studio process (devenv.exe) really opens one of that ports. You could use Process Explorer for this. I do have Process Explorer but I am not sure how I can see this information, however I have run netstat -ab and this shows that devenv.exe is listening on port 63330.
but not on any of the other ports you've mentioned. I have also captured the the log generated with Fiddler2, see screenshot attached. the error message for the 502 errors is "[Fiddler] Connection to 127.0.0.1 failed.<BR>Exception Text: No connection could be made because the target machine actively refused it 127.0.0.1:63339"
Alex, thank you for this additional information! It would be great, if you could post VS add-in logs synced with these Fildler's log. Also i would like to know, what exactly image is embeded to respons from 63330 port. (single port, returned 200 OK http code). Hi Evgeniy, the reason why they are different is beacuse they have been produced and sent at different times. I was hoping that upgrading to v6 and would resolved this but it didn't. I will try what you suggest and let you know.